It's laughing time..... Buy early - this show will sell out! Bob Marley is a riot. Celebrating 20-plus years as a stand-up comic, Bob Marley is one of the hottest and most sought-after comedians in the country. He has been featured in his own special on Comedy Central, and is one of the few comics to do the complete late-night TV circuit: The Late Show with David Letterman, The Tonight Show with Jay Leno, Late Night with Conan OBrien and The Late Late Show with Craig Ferguson and Craig Kilborn. 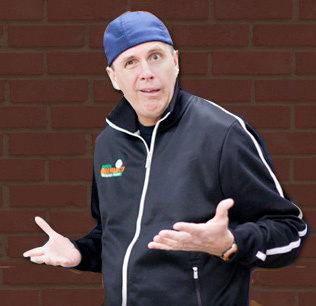 A regular at the Aspen and Montreal comedy festivals, Marley was named one of Varietys 10 Comics to Watch, Marley has also appeared in several films, including the cult favorite, Boondock Saints, where he played Detective Greenley. Marley, a Maine native and University of Maine at Farmington graduate, uses biographical and observational material for his high-energy routines. He began his career in his hometown of Portland, and then moved to Boston to gain experience in a city known for spawning comedy all-stars. He works nonstop throughout the country, in such cities as Los Angles, Las Vegas, Washington, D.C., Boston, New York and Denver. And after living in Los Angles for several years, he, his wife and three children have returned to Maine to live.